Thousands of teachers have created an Assignment in the last semester on HowTheMarketWorks, and we are happy to report that we’re launching another group of features just for you! Now when you create your custom stock trading game you will be given the option to create an Economics, Personal Finance, Business, Social Studies or Math “assignment” for your class. These “assignments” are a collection of topic-related tasks that draw on specific articles, videos, and interactive calculators in the HTMW Education Center. All of the articles even have a 3 – 5 question quiz at the end to make sure the students grasp the key concepts. For example, the Economics assignment requires the students to read articles on the Federal Reserve, the GDP, and Supply and Demand Curves; while the Personal Finance assignment requires the students to use the Compound Interest calculator and the How to be Millionaire calculator. All the assignments also include videos on how to use the HowTheMarketWorks site and count the number of stock and mutual fund trades made. 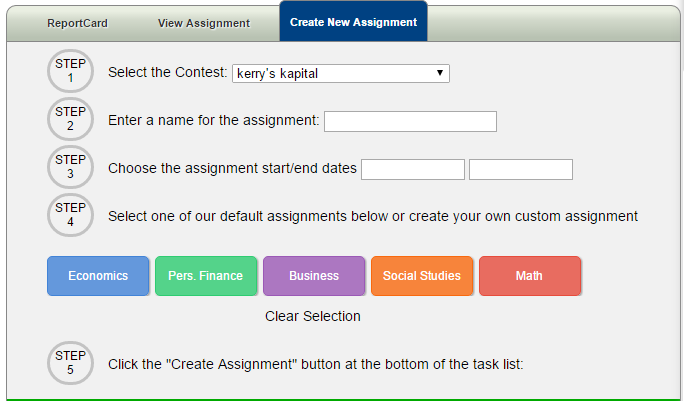 This new feature will let you make multiple assignments for your class – for example, a new assignment with new articles and trades every week – but also makes it easier if you just want one assignment for the duration of your contest. Click Here To Set Up Your Class Contest, Or Add An Assignment To One You Already Have! We have also added the ability export your entire class’s Report Card to Excel, so you can see every student’s progress all in one place. The articles are for a wide range of grade levels (with the Fractions article focusing more on middle school, but the Comparative Economic Systems focusing more on High School), but each has been written in plain English that all students can follow and learn from. Check them out today!